We grow many things in our backyard – decorative plants, flower plants, vegetables, medicinal plants etc. This year when Shilpa visited us, she took pictures of as many different plants as possible. She asked me to write a little about each one. I thought of starting the series with nutmeg. We have a big nutmeg tree in our front yard. Nutmeg is called Jaiphal in Konkani and jayikai in Kannada. It belongs to Myristica genus. It is a commercial plant. The fruits have nutritional as well as medicinal value. Indonesia, India and Sri Lanka mainly grow this crop. Greneda islands in America also grow Nutmeg. Read more about nutmeg at wiki. Nutmeg has male and female trees. It was told in earlier days that one should grow both male and female trees to get the fruits. In our courtyard, there is only one tree – possibly female – which gives good yield. The tree needs a lot of water during summer(March to May). 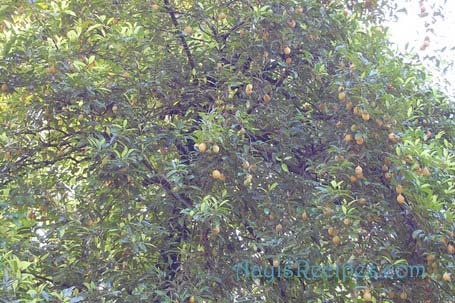 Few years back, we used to have water problem during summer because of which, we hardly used to get any fruits. We had considered removing this tree. But these days the condition has improved, so we get good crop. Nutmeg looks like an arecanut/beatlenut fruit. The tree looks like the tree of kokum. It bears hundreds of fruits at a time. 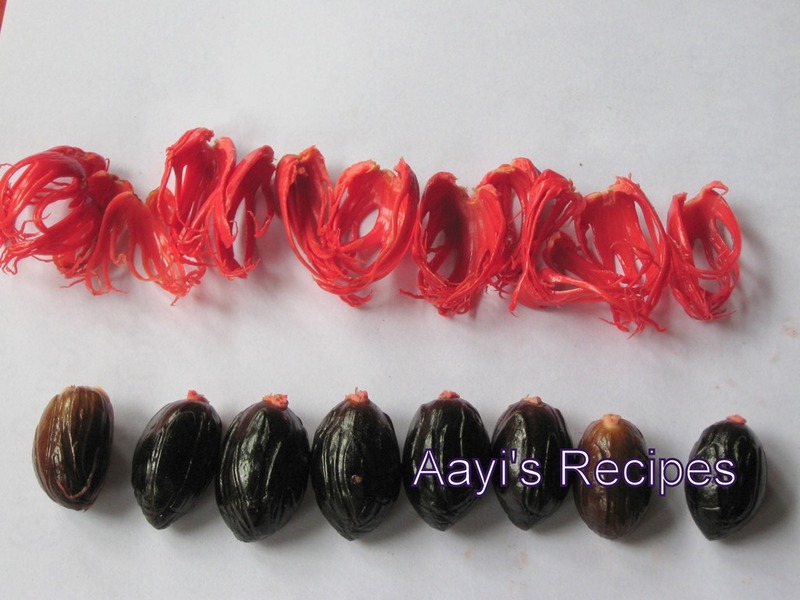 When the fruit is tender, the mace(japatri) has white colour. 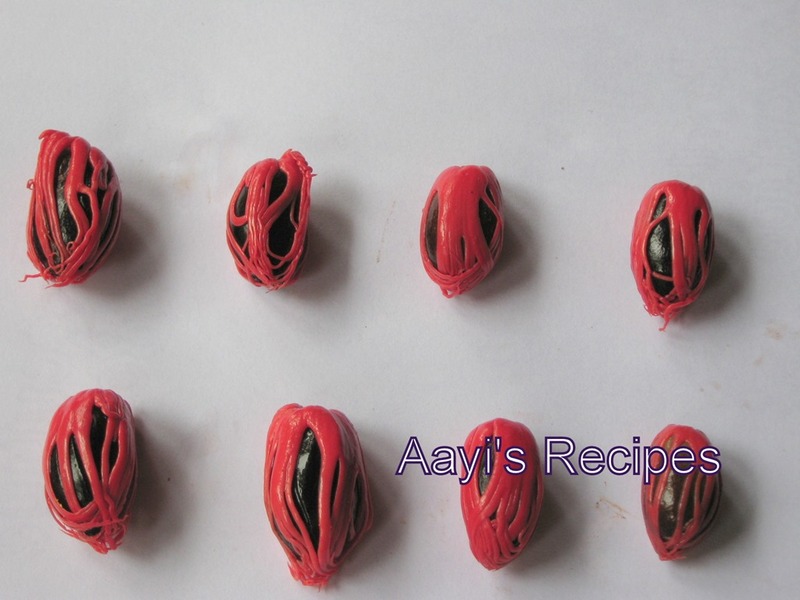 After full ripening – usually in June or July, the fruit breaks open and the nutmeg inside covered with reddish mace(japatri) in the manner of net all around, appears. We pick them at this stage. We separate mace from nutmeg and sundry them separately. The outer light colored shell is discarded (many people eat these, but we never ate them or used them in food). Thus we get two types of condiments in a single tree. The colour of mace remains red after sundrying. It looses its colour if it is over dried. The proper colour vanishes after storing for a long time. It is a cumbersome procedure to dry these nutmeg and mace as they ripen in rainy season and if they are not dried properly, they get spoiled. When the nutmeg is dried completely, we can hear a rattling sound when the fruit is shaken. While using in food, the outer black colored shell is broken to get the actual spice. 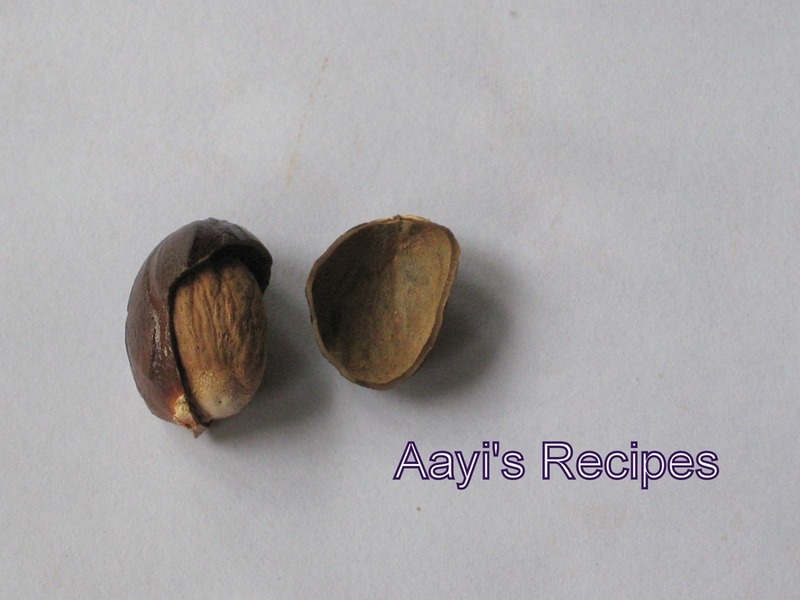 Nutmeg and mace are valuable because of their oily contents which are rich in chemicals like myristic acid compounds. Mace contains more chemicals than nutmeg and hence it is costlier. Indonesian nutmegs contain about 9% chemicals while the rest contain 2 -3% chemicals. 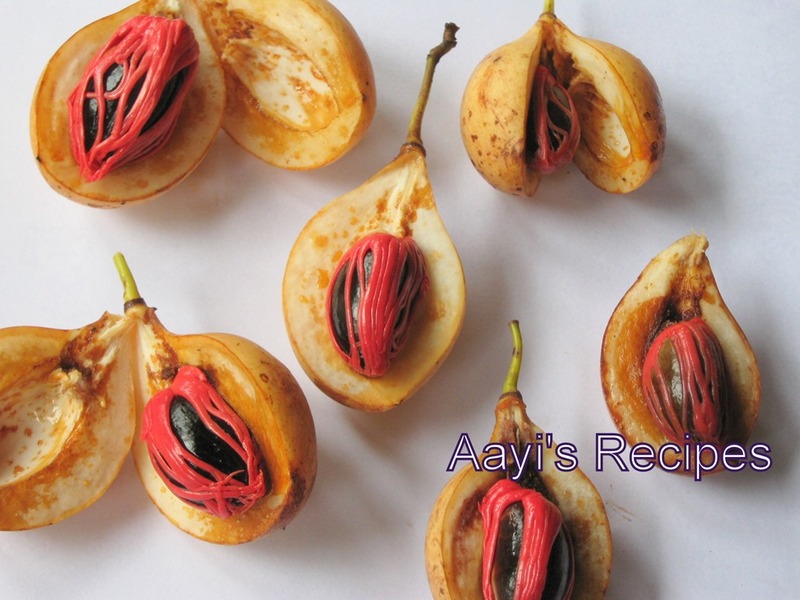 Nutmeg and mace are used in many no vegetarian preparations, bakery products, chewing gums, sweet dishes and soups. It has got some medicinal value. Nutmeg is applied externally to remove pain and swelling. Though nutmeg is an expensive spice to buy, we feel it is not a profitable tree for us. When it is sold, we get quite a low rate since shop keepers usually buy it in kilos and it is a very light spice. We usually give it away to relatives and friends. Only if we manage to save some and dry them well, we sell them. Apart from being a very useful tree, we all have emotional attachment to this tree. When my children were kids, they loved to play under this tree. They loved to pick nutmeg and also loved to play with the shells. Everyone who comes to our home, asks about this tree because it is quite unusual for many. In June, July when it bears fruits, we get to see very beautiful (and unusual to our area) birds on this tree. I think they come there to eat the fruit. They take many fruits and sometimes we find the fruits even in our neighbors backyards. Looking forward to the the rest of the plant and tree series! Your kokum fruit/tree post is one of my all time favorites. I saw this tree in Kerala for the first time and thought it was a lime tree!!! 🙂 I love nutmeg. All this reminds me of the numerous trees in my Kaka aajoba and Mama Aajo’s houses in Bangalore and Karwar respectively. Both had a backyard abundant in trees, decked like queens in fruits… be it a mango harvest or a sweet pulpy jackfruit tall tree,… we enjoyed the luscious fruit sitting in the spacious houses.. Now, as sadly both of them have passed on…. that luxury has left too…but the smells and memories have come rushing back thanx to your post… the same “bhaani ujja vaas” the fire under the huge metal pot in the backyard heating bath water… we used to love bathing in the water which smelt of the burnt wood….thank you aunty for making my day!! Wow you have this in your home garden. what a wonderful post! Thanks for all the info about the life cycle of this fruit. My aunt is an expert at pickles and once she had made a pickle of fresh jaiphal. It is unbelievably aromatic and delicate in taste. She had used our regular pickle masala for it but the fruit itself took it to an exotic exceptional level. Do try when you have them in season if you have not yet. lovely pics and a nice post! Great post. Eager to read the series. I have some doubts. Is mace derived from Nutmeg? I have the nutmeg dried pods, so should I be breaking them open to use the spice? Is it powdery inside? Does it stain? I have noticed some premade masalas here in US contain small amounts of nutmeg, maybe chenna or rajmah masala. This is why I bought it to try my hand at making home made masalas…but I have lots leftover!! Can you later post any recipe (if not already there) on making homemade chenna, rajmah, garam masalas? Thanks. 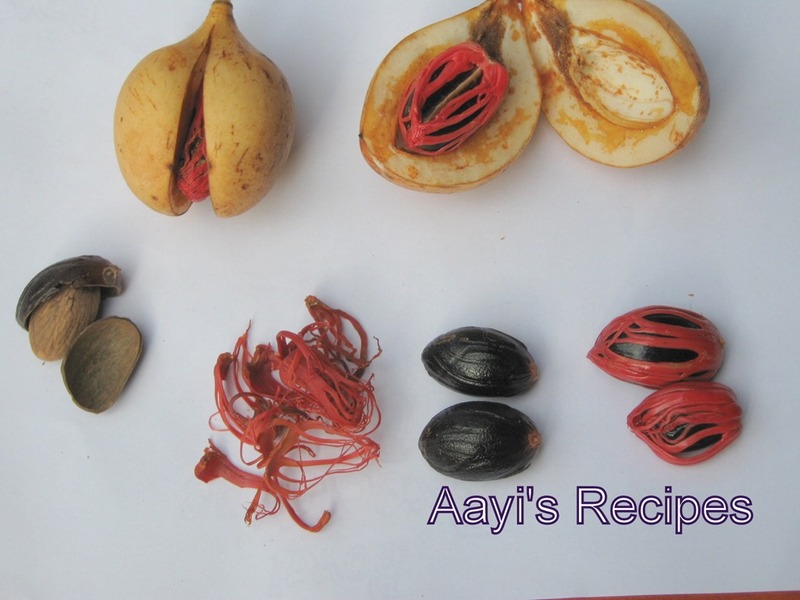 Shilpa: Mace is the outer net like thing surrounding the nutmeg shown in above picture. I am not sure if you have got nutmeg with or without shell. Just try breaking it. If the outer shell easily comes out, throw it and use the spice inside(which is also hard). If by breaking, the shell does not separate, then it means you have got them without shell. Someone who has used nutmeg before can easily identify between the two, but if you are using for the first time, you could try this. It is not powdery, please see the picture above. In the first picture, there are two nutmegs where shells are opened. It is hard. It does not stain. I will keep your request in mind and see if I can post something with nutmeg. I have seen a few of the spice trees in Kerela, during our visit 10 years ago. Shilpa you are so lucky to played in the shade of this tree. 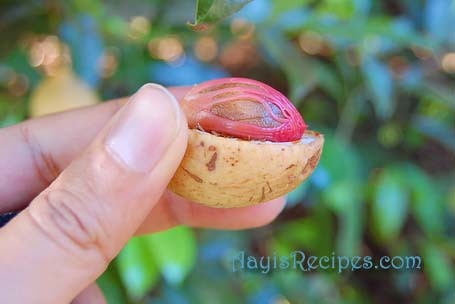 Very informative,,, never seen nutmeg tree before..
Nice infomation n also pictures.. thank you so much.. I like jayphal very much because my mamma use to gave us as a medicine for loose motions.. 🙂 Jayphal, ghee, jaggary.. hmmm yummy..
Also i want to convey u that we love you n this web site a lot.. Thanks again..
You have a great garden..
Nice read, don’t remember seeing a nutmeg tree before. There is nutmeg tree in my grandmother’s place in kerala and I remember her telling us about the male and female plants of nutmeg, but both the trees in her garden yeild fruits. This was a nice read. very informative. thank you so much. well my mom says its good during cold, while it helps a lot to fight cold when applied externally….dont know if its true. Had never seen a Jaiphal tree in my life. I know javitri is used in some garam masalas. Do you have any other recipes using this ? Shilpa: Chetna, we use nutmeg in chicken curries too. I have seen the usage of nutmeg in many sauces(for pasta) and sweets here in US. This is a very nice read, loaded with information. Never knew jaiphal and mace come from the same plant. And so lucky that you have it in your yard. Very interesting article Aayi. I have never seen a nutmeg tree. Beautiful pictures!! I normally use nutmeg when I make Aamras (Mango Rass). I have not used much in cooking though !!! What about mace, though ? Where is it used ? I did buy mace sometime back, because it looks so beautiful, just like saffron but yelloish..but never knew how to use it. So please let me know where it can be used and does it impart nice colour to the food like saffron does ? Shilpa: Chetna, as of now, nothing is coming to my mind for usage of mace, but I have seen it in few recipes. I will surely post if I find it back. 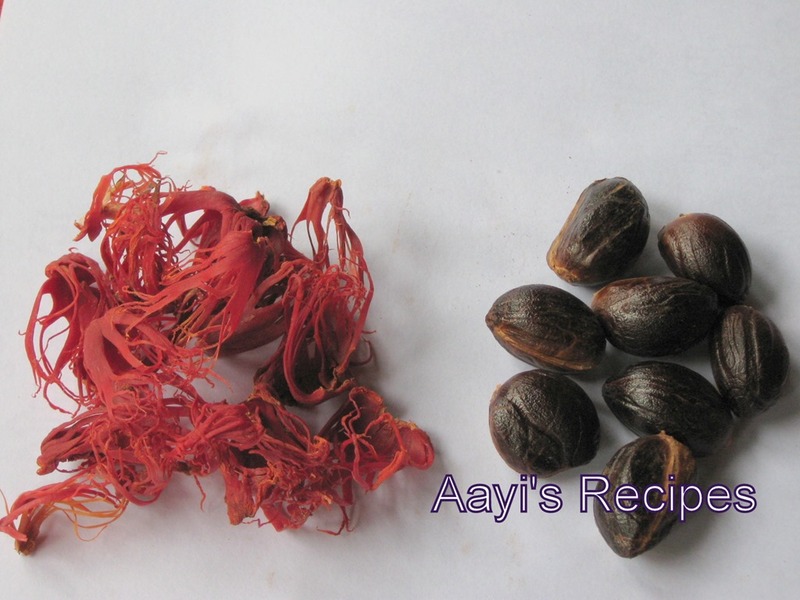 As far as I know, it is used in savory dishes in masalas. The post make a good read. Haven’t seen a nutmeg tree before. Thanks for the detailed info. Looking forward to the rest of the series. such beautiful pics. it must be a real treat to wander through your home garden. thats a very good post shilpa! so informative and lovely pics! That was a delightful read. What a pleasure it must be having such a grand tree in your backyard. This is for the first time, I am seeing Jaiphal tree. Thanks so much for sharing. That was a very informative article. Pictures are spledid. Thanks a lot for posting such an interesting article. Thank you very much for posting this on your website. It does bring back a lot of memories as Komal mentioned in her comments. it is very valuable information thanks for your comments abt jaiphal. I am at present in Sydney Australia, needed to know abt jaiphal that how it looked. I got very useful information. Thanks & God bless your team. i am a regular visitor of your blog.i tried many of your recipes like dates cake,ivy gourd sidedish,masala capsicum potato sidedish etc.i like most of your recipes.i want to inform you that the outer fleshy covering of jaiphal is good to make pickle.it is good for digestion.it is also a remedy for worm infestation.so please make use of it. 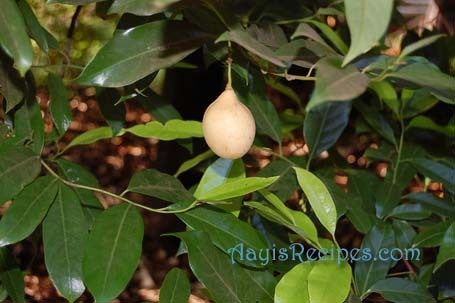 I “thought” that I have a young nutmeg tree in my backyard, however, after having looked at the above photo I am not so sure now that is what it is. My tree is a young tree and has grown approximately 2ft. this summer. It stands about 4ft. high. It yeilds a semi round green (what I thought was a nutmeg) after it has bloomed a lovely red cluster of small flowers. The leaf almost appears to be that of a fern. Would you have any suggestion as to what this tree may be? Shilpa: Jyothi, we don’t do any pollination. I am not sure how to go about it. Please check wiki. It’s true that nutmeg has aphrodisiac value? is jakai and alale kai same? An interesting article with pictures. I’m from the island, know nutmeg and many of its uses, but never saw a nutmeg tree! Thanks for sharing. very informative…these details are very rare. i learned these informations for the first time. A very good article and photographs. It has helped me in understanding about Jaiphal. We buy this material without shell. Very useful article, would love to visit your backyard to see these wonderful trees. Very nice and informative article, complete with pictures and detailed pictures. Awesome, even better than Wiki. I am a cook myself and experienced that Nutmeg & Mace enhance BOTH salted/spicy & Sweet dishes equally. Kinds of extends the flavours mysteriously. In fact no special recipe needs be added as a pinch of either or both can show the difference. Glad to find your site and bookmarking it. Your article made me nostalgic. When we were growing up in Kodagu, we used to use Jayikai as a throw balls and play around. My grandfather used to use them for his patients..he was a herbal and mantra/yantra expert and had a very good name. that was back in 60’s. Nice to have come across this site.